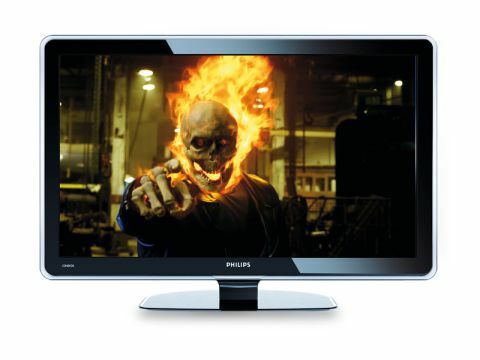 Simply put, we've never seen a ﬂat screen that handles motion as ably as the Philips 47PFL9603D. Thanks to clever use of advanced processing technology, eliminating LCD's traditional judder and motion, this TV is so smooth that you'd expect it to order a vodka Martini and steal your girlfriend from right under your nose. It also delivers stiletto-sharp detail and crisp colours, and sports a superb array of features, top class connectivity and an eye-catching design – making it one of the ﬁnest big-screen TVs on the market. While there's a lot of plastic on show, the set looks well-made and there are some premium touches like the glass stand and transparent 'halo' around the edge of the screen frame. There are also a couple of Scarts (both RGB capable), a Common Interface slot and a USB port for viewing digital photos. You'll also ﬁnd an Ethernet port at the back, allowing you to hook the TV up to your home network to stream audio and still images from a DLNA-certiﬁed server or computer. The eye-popping picture quality is mainly due to Philips' suite of proprietary image-enhancing technologies, most drawn together under the Perfect Pixel HD Engine banner. In brief, it combines several scaling, contrast-boosting, noise reduction and motion processing modes, all of which can be adjusted separately by the viewer. For us the standout aspects are Perfect Natural Motion and 100Hz Clear LCD, both of which improve motion. The former, designed for use with movie content, corrects judder with movie content, whether it's from a 60Hz source like Sky HD or DVD or a 24p source like Blu-ray. It's no exaggeration to say it succeeds in creating the smoothest motion we've ever seen on a ﬂat TV, totally removing judder and yet retaining a movie's cinematic feel at the same time. 100Hz Clear LCD, meanwhile, keeps moving objects sharp and blur-free by inserting extra frames between the originals. The two work brilliantly well. Watching Ghost Rider on Sky HD, as the camera pans left to right along a line of text, each letter remains crisp and slides smoothly across the screen. When we turned Perfect Natural Motion off, it started jerking unsteadily. Clear LCD means that fast-moving video games don't suffer from the unsightly ghosting effect, and also excels with sport and movies. Even during speedy pans, both standard and HD material remains crisp. 24p Blu-ray material is also fully supported, and moves just as smoothly. There are no major side-effects to using this tech, although we did spot a slight shimmer around some moving objects. HD pictures are finely detailed (as you'd expect from a TV boasting a 1920 x 1080 resolution), and colour reproduction is vibrant. It doesn't have the wide colour gamut feature of the pricier 47PFL9703D model, but can create smooth, steady dark to light transitions with no colour banding effect, plus realistic skin tones. Dynamic contrast is currently en vogue with TV makers, so it's no surprise to ﬁnd it here. It works by strategically dimming the backlight during darker scenes, and with it switched to its maximum Philips claims it delivers a contrast ratio of 30,000:1. The built-in speakers are invisible from the outside, but work well and provide solid sonic accompaniment to whatever you're watching. Interestingly, high-end Philips models like this don't come with the impressive bass-boosting wOOx technology used in the mid-range 7603 models. Despite the dizzying amount of features and functions it carries, the 47PFL9603D is generally straightforward to use. The menu system is well designed, with individual picture and sound elements easy to ﬁnd and adjust. One touch we're not a big fan of is the cursor control on the remote control, which doubles up as a wheel that be used to scroll through menus and speedily tweak volume or picture parameters. While there's nothing wrong with that as a concept (it works well on the iPod), here it's just too unwieldy, often registering a turn when you're trying to click one step up, down, left or right. All things considered, the Philips 47PFL9603D is a top drawer TV for the price. While it lacks the supreme black levels of a top of the range Pioneer KURO set, its crystal clear picture and ultra-slick motion mean it makes a very viable (and much cheaper) alternative for performance-hungry shoppers. Go get it!